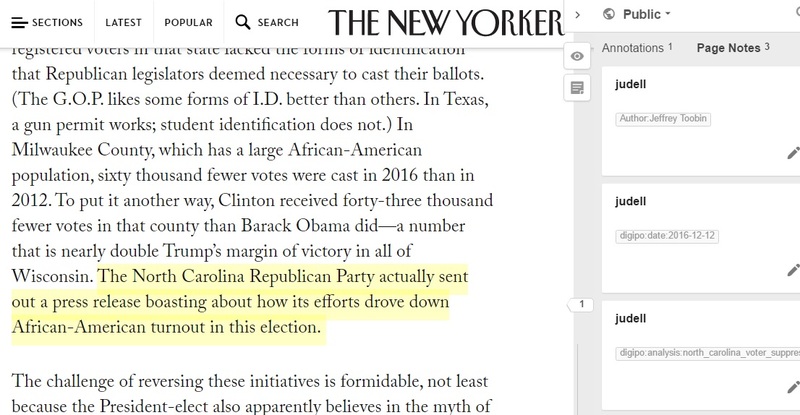 Claim: The North Carolina Republican Party sent out a press release boasting about how its efforts drove down African-American turnout in the 2016 US presidential election. As we were fleshing out how a DigiPo course would work, I wrote an analysis of that claim. The investigation took me all the way back to the 1965 Voting Rights Act. Then it led to the 2013 Supreme Court decision — in Shelby vs Holder — to dilute the “strong medicine” Congress had deemed necessary “to address entrenched racial discrimination in voting.” Then to a series of legal contests as North Carolina began adjusting its voting laws. Then to the election-year controversies about voter suppression. And finally to the press release that the North Carolina GOP sent the day before the election, and the reactions to it. Many claims don’t require this kind of deep dive. As Mike writes today, core strategies — look for fact-checking prior art, go upstream to the source, read laterally — can resolve some claims quickly. But some claims do require a deep dive. In those cases I want students to immerse themselves in that process of discovery. I want them to suspend judgement about the claim and focus initially on marshalling evidence, evaluating sources, and laying a foundation for analyis. It’s hard work that the DigiPo toolkit can make easier, maybe even fun. That’s crucial because the longer you can comfortably dwell in that zone of evidence-gathering and suspended judgement, the stronger your critical thinking will become. When I first read Toobin’s claim my internal narrative was: “Boasted about voter suppression? Of course those neanderthals did!” Then I entered the zone and spent many hours there. Voter suppression wasn’t a topic I’d spent much time reading about, so I learned a lot. When I returned to the claim I arrived at an interesting judgement. Yes there was voter suppression, and it was in some ways more draconian than I had thought. But had the North Carolina GOP actually boasted (Mother Jones: bragged, Salon: celebrated) the lower African-American turnout? I concluded it had not. It had reported reduced early voting, but not explicitly claimed that was a successful outcome of voter suppression. In a press release on November 7, 2016, the North Carolina GOP reported lower African-American early voting. That’s easy to check. True. In its 11/7/2016 press release the North Carolina GOP boasted about the success of its voter suppression efforts. Also easy to check: False. In the wake of Shelby vs Holder, the North Carolina GOP pushed legislation that discriminates against African-American voters. You need to gather and organize a lot of source material in order to even begin to evaluate that claim. My fondest hope for DigiPo is that students inclined to judge the claim, one way or the another, will delay that judgement long enough to gather evidence that all can agree is valid. That, I believe, would be a fantastic educational outcome. I’m fired up about the work I want to share at Domains 2017 this summer. The tagline for the conference is Indie Tech and Other Curiosities, and I plan to be one of the curiosities! This is the idea that within the use of every technical tool there is more than just the consciousness of that tool, there is also the possibility to spark something beyond those predefined uses. The only real way to galvanize that potentiality is to provide the conditions of possibility — that is, a toolkit for user innovation. My recent collaboration with Mike Caulfield on the Digital Polarization Initiative has led to the creation of just such a toolkit. It supports DigiPo in the ways described and shown here. A version of the toolkit, demoed here, will support a team of investigative journalists. Now I need to show how the toolkit enables educators, scientists, investigative reporters, students — anyone who researches and writes articles or reports or papers backed by web-based evidence — to innovate in similar ways. In tech we tend to abuse the term innovation so let me spell out exactly what I mean: Better ways to gather, organize, reason over, and cite online evidence. Web annotation, standardized this week by the W3C, is a key enabler. The web’s infinite space of addressable URLs is now augmented by a larger infinity of segments of interest within the resources pointed to by URLs. In the textual realm, paragraphs, list items, sentences, or individual words can be reliably linked to conversations — but also applications — that live in connected annotation layers. A web of addressable segments of interest is a necessary, but not sufficient, condition of possibility. We also need tools that enable us to gather, organize, recombine, and cite those segments. And some of those tools need to be malleable in the hands of users who can shape them for their own purposes. He has dozens of possibly pertinent books and articles in his memex. First he runs through an encyclopedia, finds an interesting but sketchy article, leaves it projected. Next, in a history, he finds another pertinent item, and ties the two together. Nowadays that first encyclopedia article lives at one URL. The pertinent item in a history is a segment of interest within another URL-addressable resource. How do we tie them together? A crucial connector is a tag that belongs to neither resource but refers to both. When tools control the sets of tags available for resource interconnection, they enable groups of people to make such connections reliably. 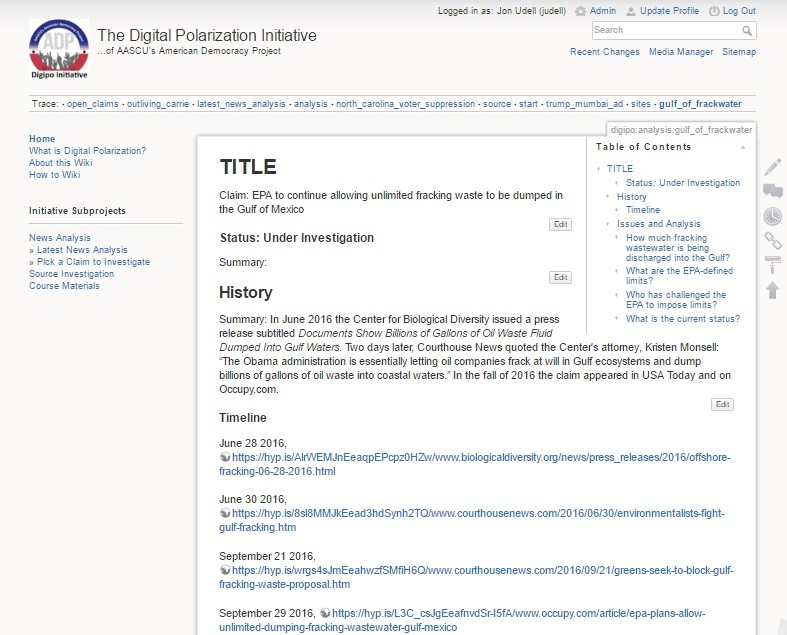 That’s what the DigiPo toolkit does when it offers a list of investigation pages, drawn from the namespace of a wiki, as the set of tags that connect annotation-defined evidence to investigations. You see that happening with the DigiPo toolkit shown here, and with a variant of the toolkit shown here. In both cases the tags that bind evidence to wiki pages are controlled by software that acquires a list of wiki pages and presents the names of those pages as selectable tags. One future direction for the toolkit leads to software that acquires lists of pages from other kinds of content management systems: WordPress, Drupal, you name it. Every CMS defines a namespace that is implicitly a list of tags that can be used to bind sets of resources to the pages served by that CMS. If you’re looking to adapt a DigiPo-like tool to your CMS, I’ll be delighted to show you how. It’s about understanding the components of the Web and knowing how to tag and then manipulate them. By thinking and developing sets of named resources, you are a Web thinker. This isn’t about programming but rather the creation of sets of resources and the identification of components that work with those resources and combine them to create solutions. 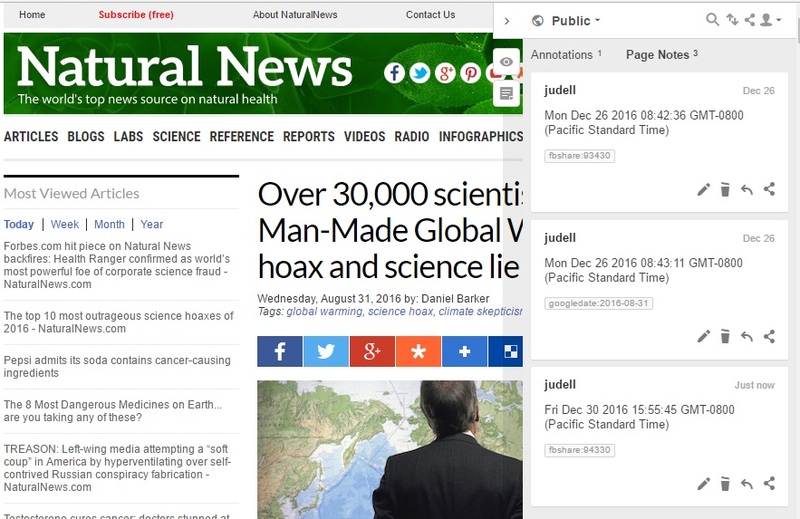 Web annotation vastly enlarges the universe of resources that can be named. But it’s on us to name them. Tags are a principal way we do that. If our naming of resources is going to be an effective way to organize and combine them, though, we need to do it reliably and consistently. Software can enforce that consistency, but not everyone can write software. So a user innovation toolkit for the annotated web needs to empower users to enforce consistent naming without writing code. Here’s my response. That tag helper, now incorporated into the toolkit I’m evolving for DigiPo and other uses, makes it possible for people who don’t write code to define tag namespaces that govern their gathering, organization, recombination, and citation not only of URL-addressable resources but also of annotation-addressable segments of interest within those resources. 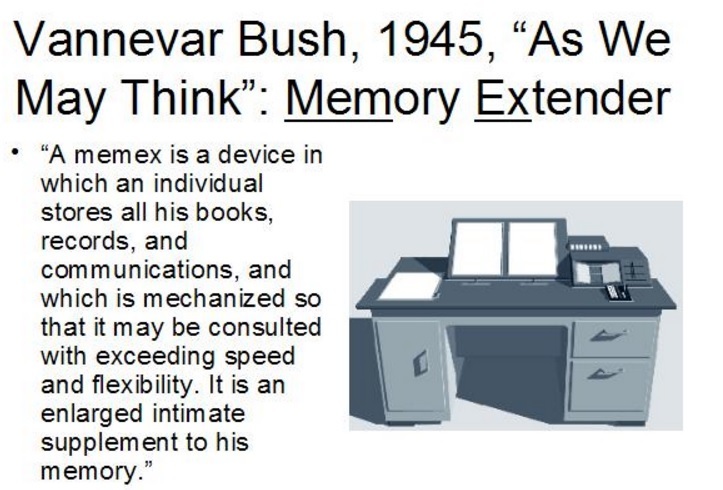 People can “tie them together” — as Vannevar Bush imagined — in the ways their interests and workflows require. Does that answer the question? If not, please keep asking until I do so properly. User-defined tag namespaces, though admittedly still a curiosity, are one of the best ways to make collective use of a web of addressable segments. Construction: Programs are houses built on foundations called platforms. Ecology: Programs are organisms that depend on ecosystem services provided by platforms. Community: Programs work together in accordance with rules defined by platforms. Architecture: Programs are planned, designed, and built according to architectural plans. Economics: Programs are producers and consumers of services. Computer hardware: Programs are components that attach to a shared bus. All are valid and may be useful in one way or another. In this essay I focus on the last because it points to an important way of understanding what web annotation can enable. My claim here is that the web’s emerging annotation layer forms a shared bus for a new wave of content-oriented applications. A computer’s bus connects devices: disk drive, keyboard, network adapter. If we think of the web in this way, we’d say that devices (your computer, mine) and also people (you, me) attach to the bus. And that the protocol for attachment has something to do with URLs. You can, for example, follow this link to display and interact with the set of Hypothesis annotations related to this web page. You can also paste the link’s URL into a message or a document to share the view with someone else. That same URL can behave like an API (application programming interface) that accesses the resource named and located by the URL. 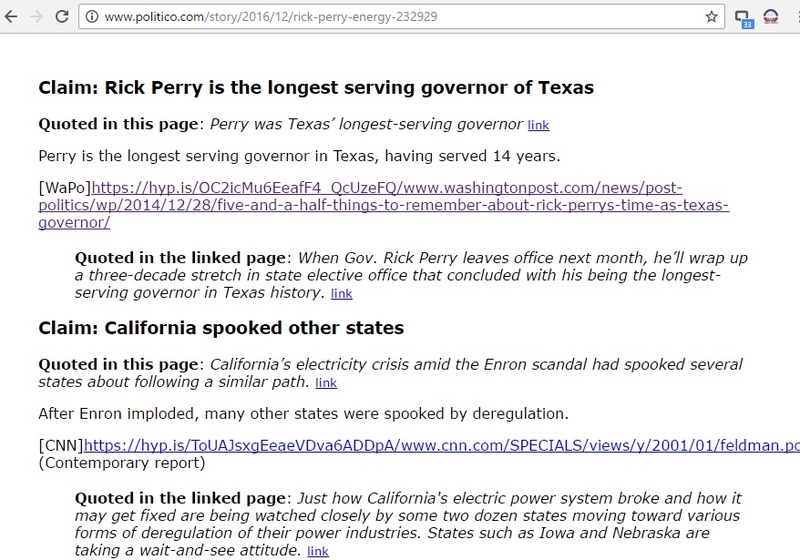 A page like this one, part of the DigiPo fact-checking project, uses the link that way. It derives the Hypothes search URL from its own URL, and injects the resulting Hypothesis view into the page. Every time we create a new wiki page at digipo.io, we mint a new URL that summons the set of Hypothesis annotations specific to that page. In principle there’s no limit to the number of such pages — and associated sets of annotations — we can add. And that’s just one of an unlimited number of sites. The web of URL-addressable resources is infinitely large. Even so, URLs address only a small part of a larger infinity of resources: words and phrases in texts, regions within images, segments of audio and video. Web annotation enables us to address that larger infinity. The DigiPo project illustrates some of the ways in which annotation expands the notion of content as a bus shared by people and computers. But first some background on how annotation works. Many Annotations refer to part of a resource, rather than all of it, as the Target. We call that part of the resource a Segment (of Interest). A Selector is used to describe how to determine the Segment from within the Source resource. When the segment of interest is a selection in a textual resource, one kind of selector captures the selection and its surrounding text. Another captures the position of the selection (“starts at the 347th character, ends at the 364th”). Still another captures its location in a web page (“contained in the 2nd list item in the first list in the seventh paragraph”). For reasons of both speed and reliability, Hypothesis uses all three selectors when it attaches (“anchors”) an annotation to a selection. When a segment of interest is a clip within a podcast or a video, a selector would capture the start and stop (“starts at 1 minute, 32 seconds, ends at 3 minutes, 12 seconds”). When it’s a region in a bitmapped image, a selector would capture the coordinates (“starts at x=12,y=53, ends at x=355,y=124”). When it’s a piece of a vector image, a selector would capture the Scalable Vector Graphics (SVG) markup defining that piece of the image. The W3C’s model of web annotation lays a foundation for other kinds of selectors in other domains: locations in maps, nodes in Jupyter notebooks, bars and trend lines and data points in charts. But let’s stick with textual annotation for now, consider how it expands the universe of addressable resources, and explore what we can do in that universe. The author has cited a Hypothesis link that refers to a piece of evidence in another web page. The link encapsulates both the URL of that page and a set of selectors that mark the selected passage within it. When you follow the link Hypothesis takes you to the page, scrolls to the passage, and highlights it. That’s a powerful interactive experience! Now suppose you want to review all the evidence that supports this investigation. You can do it interactively but that will require a lot of context-disrupting clicks. So another program embedded in the wiki page summarizes the cited quotes for you. It uses a variant of the Hypothesis direct link that delivers the interactive experience. The variant is a Hypothesis API call that delivers the annotation in a machine-friendly format. The summarization script collects all the Hypothesis direct links on the page, gathers the annotations, extracts the URLs and quotes, injects them into the Footnotes section of the page, and rewrites the links to point to corresponding footnotes. To enable this magic, an app that people can use to annotate regions in web pages is necessary but not sufficient. You also need an API-accessible service that enables computers to create and retrieve annotations. Even more fundamentally, you need an open web standard that defines how apps and services work not only with atomic resources named and located by URLs, but also segments of interest within them. What else is possible on a shared content bus where segments of interest are directly addressable both by people and computers? Here’s one idea being pondered by some folks in the world of open educational resources (OER). Suppose you’re creating an open textbook that attaches quizzes to segments within the text. The quizzes live in a database. How do you connect a quiz to a segment in your book? Because a quiz is an URL-addressable resource, you can transclude one directly into your book near the segment to which it applies. Doing that normally means encoding the segment’s location in the book’s markup so the software that attaches the quiz can put it in the right place. That works, but it entangles two editorial tasks: writing the book, and curating the quizzes. That entanglement makes it harder to provide tools that support the tasks individually. If you can annotate segments of interest, though, you can disentangle the tasks, tool them separately, build the book more efficiently, and ensure others can more cleanly repurpose your work. Analogies are necessary but imperfect. The notion of a shared bus, formed by an annotation layer and used by applications oriented to segments of content, may or may not resonate. I’m looking for a better analogy; suggestions welcome. But however you want to think about it, the method I’m describing here works powerfully well, I’ll continue to apply it, and I’d love to discuss ways you can too. I’m not a scholar, nor do I play one on TV, but when I search Google Scholar I find that I’m cited there a few times, most notably for a 1994 BYTE cover story, Componentware. The details there are at best of historical interest but the topic remains evergreen: How do we package software in ways that maximize its reusability while minimizing the level of skill required to achieve reuse? That architecture has in some ways remained the same, in other ways evolved dramatically, but its generative power continues to surprise and delight me. And I keep finding new ways to package and reuse web components. The “Matching Annotations” widget embedded in that page is just this search result wrapped in an iframe. This is one of the most common and powerful ways to reuse web components. Or you can use the Hypothesis proxy, https://via.hypothes.is/, to inject the client into a web page, for example: https://via.hypothes.is/https://en.wikipedia.org/wiki/Proxy_server. When you use Hypothesis to annotate a PDF file, it relies on a separate component — Mozilla’s PDF.js — to parse the PDF and render it in the browser so the Hypothesis client can operate on it. 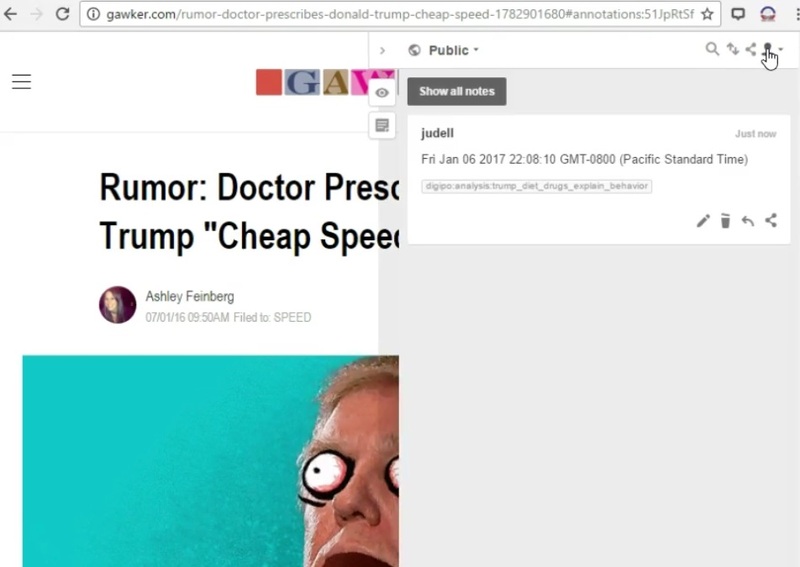 PDF.js is available natively in Firefox, the Hypothesis Chrome extension injects it when you annotate a PDF in that browser. Another Hypothesis component, pdf.js-hypothesis, enables a web server to serve a PDF with PDF.js and Hypothesis both active. 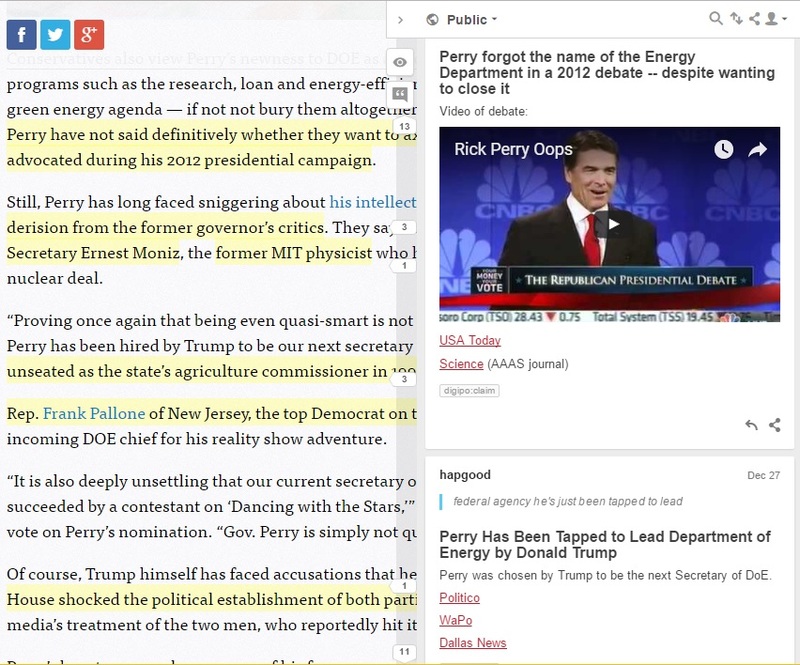 That makes PDF annotation available in any browser. We use it in our prototype Canvas app, for example, to serve annotation-enabled PDFs in the Canvas learming management system (LMS). Still another component enables custom rendering of annotations. 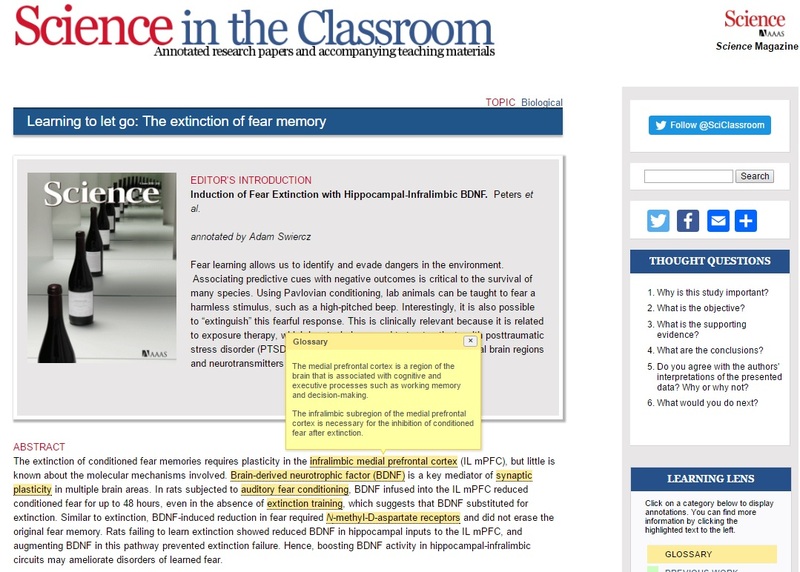 You can see it in action at Science in the Classroom, a collection of research papers annotated to serve as teaching materials. Graduate students use Hypothesis to create the annotations. But Science in the Classroom prefers to display them using its own mechanism, Learning Lens. So when the page loads, it fetches annotations using the Hypothesis API and then paints them on the page using a component that’s part of the Hypothesis client but is also available as the standalone NPM module dom-anchor-text-quote. I am deliberately blurring the definition of web component because I think it properly encompasses many different things: a web page embedded in an iframe; an API-accessible web service; a rich client application like Hypothesis (or a simple widget like the Timeline) embedded in a web page; a standalone module like dom-anchor-text-quote; a repackaging of Hypothesis as a WordPress plugin or a Canvanas external tool. This is a rich assortment of ingredients! But there’s one that’s notably absent. We’ve seen lots of ways to use the Hypothesis client as a component that plugs into other environments and makes annotation available there. But what if you want to plug something into the Hypothesis client? There isn’t yet a mechanism for that. The code is open source and can be modified, as Marija Katic and Martin Eve have done with Annotran, a translation tool based on Hypothesis. That’s a great example of code reuse. But it isn’t, at least to my way of thinking, an example of component reuse. Although I recognize many different species of software components, they all share one piece of common DNA: reuse without internal modification. 1. Standard protocols. In the LMS world, Learning Tools Interoperability (LTI) defines those protocols. 2. Frictionless component reuse. This flows from item 1. An LTI app expects to be launched from an LMS and to run embedded in an iframe there. Again, this is the most common and powerful way to reuse web components. I had already tried a couple of experiments to add controlled tagging to the Hypothesis client. In this one, the tag suggestions offered in the tag editor are bound to Hypothesis groups. In this one, tag suggestions are bound to an external web service. Both experiments entailed nontrivial alteration of the Hypothesis client. In a third experiment, I modified the Hypothesis client in a way that could enable a family of components to plug into it. This customized client embedded an iframe in the annotation editor, and launched a user-defined web application into that iframe, passing it one parameter: the id of the annotation open in the editor. Because it was configured with the credentials of a Hypothesis user, it could work as a pluggable component that communicates with the active annotation and also with the full panoply of web resources. You could, perhaps, think of it as an annotation applet. Here’s a demo. This approach was intriguing and might serve some useful purposes, but an iframe is an ugly and awkward construct to stick into the middle of a richly-designed web client. And this approach again fails my definition of component reuse because it requires internal modification of the client. So as I began working to integrate Hypothesis into Digipo I was still looking for a way to control Hypothesis tags without modifying the Hypothesis client. 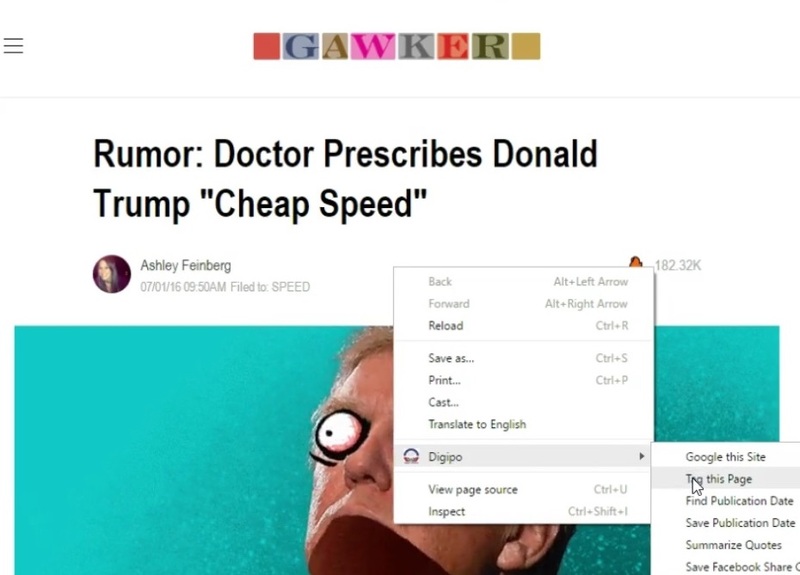 As described in A toolkit for fact checkers, we initially used bookmarklets to do that, then began developing a Chrome extension for the Digipo project. The Chrome extension immediately solved a couple of vexing problems. It enabled us to cleanly package a growing set of Digipo tools, by making them conveniently right-click-accessible. And it got around the security constraints that increasingly make bookmarklets untenable. Just as importantly it enabled us to blend together a Digipo-specific set of tools, some but not all of which are Hypothesis-powered. For a Digipo fact checker, Hypothesis isn’t a primary part of the experience. It’s a supporting component that’s brought into the process as and where needed. It’s infrastructure. That leads to a page that lists the Digipo investigations. 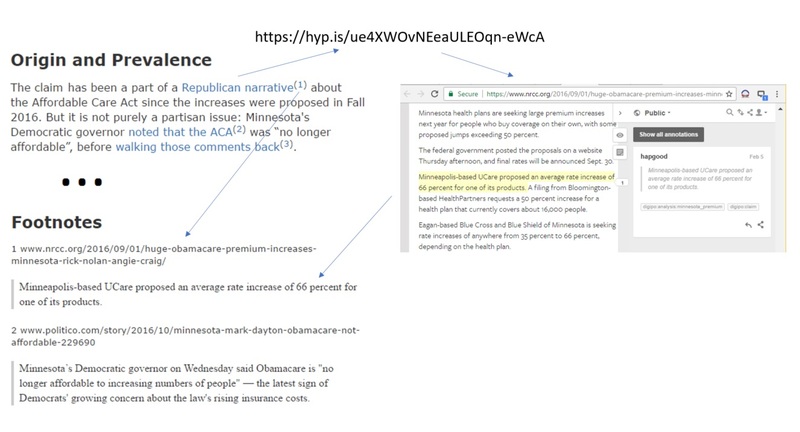 When you choose one, the extension uses the Hypothesis API to create a page note with the investigation’s tag. Thanks to Hypothesis direct linking, the interaction flows seamlessly from the Digipo extension to Hypothesis. You land in the annotation editor where you can do more with Hypothesis: add comments and new tags, discuss the target document with other Hypothesis users. But this arrangement only creates Hypothesis page notes: annotations that refer to a target document but not to a selection within that document. More powerful uses of Hypothesis flow from selections within target documents. Could a selection-based annotation begin in the Digipo extension, acquire a tag, and then flow through to Hypothesis? Happily the answer is yes. You can see that here. 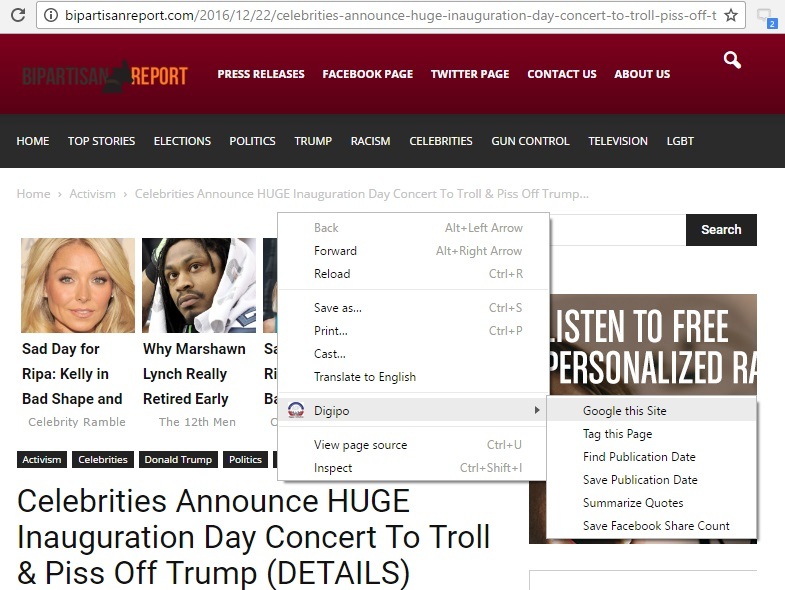 The Digipo Chrome extension presents one set of helpers when you right-click on a page with nothing selected. 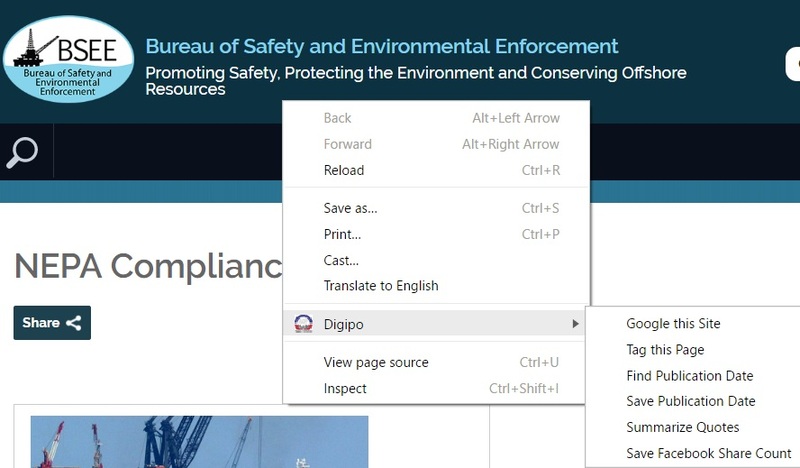 Some of the helpers rely on Hypothesis, others just automate parts of the Digipo workflow — for example, launching advanced Google searches. 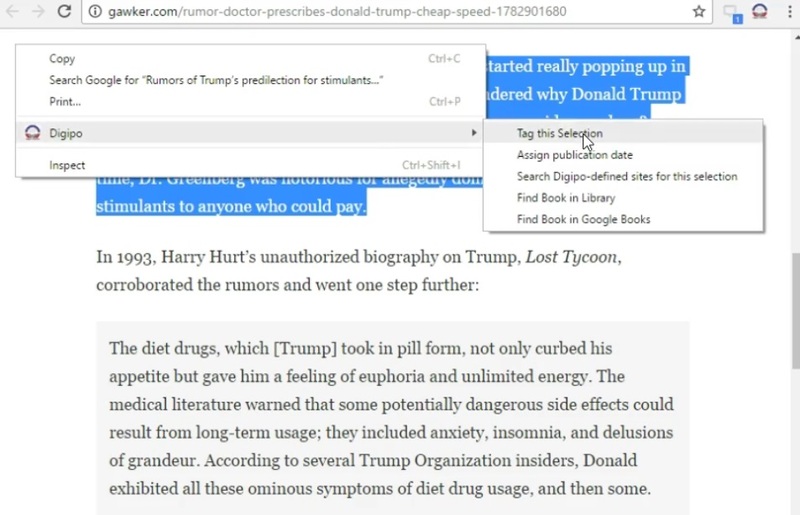 When you right-click with a selection active, the Digipo Chrome extension presents another set of helpers which, again, may or may not rely on Hypothesis. One of them, Tag this Selection, works like Tag this Page in that it uses the Hypothesis API to create an annotation that includes a controlled tag. But Tag this Selection does a bit more work. It sends not only the URL of the target document, but also a Text Quote Selector that anchors the annotation within the document. In this case, too, the interaction then flows seamlessly into Hypothesis where you can edit the newly-created annotation and perhaps discuss the selected passage. You can see more of the interplay between the Digipo and Hypothesis extensions in this screencast. I’m pretty excited by how this is turning out. The Digipo extension is Chrome-only for now, as is the Hypothesis extension, but WebExtensions should soon enable broader coverage. There’s still a need to plug packaged behavior directly into the Hypothesis client. But much can be accomplished with an extension that cooperates with Hypothesis using its existing set of affordances. 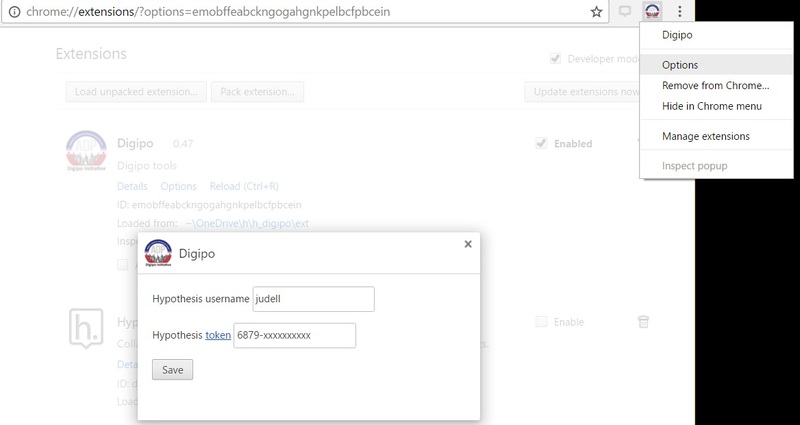 The Digipo extension is one example. I can imagine many others, and I’m expanding my definition of componentware to include them. 1 I love how our copy editor insisted on hyphenating On-Line! 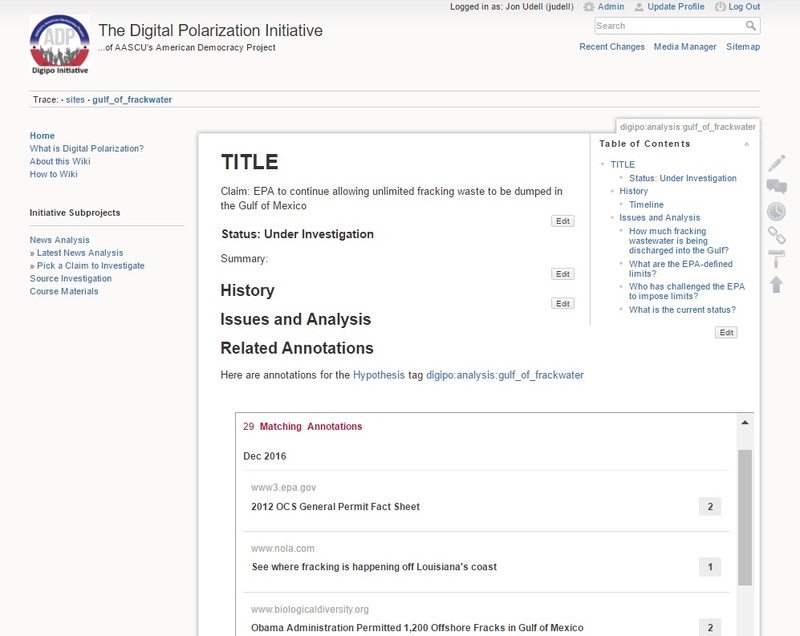 Mike Caulfield’s Digital Polarization Initiative (DigiPo) is a template for a course that will lead students through exercises to analyze and fact-check news stories. The pedagogical approach Mike describes here is evolving; in parallel I’ve been evolving a toolkit to help students research and organize the raw materials of the analyses they’ll be asked to produce. Annotation is a key component of the toolkit. I’ve been working to integrate it into the fact-checking workflow in ways that complement the use of other tools. We’re not done yet but I’m pleased with the results so far. This post is an interim report to summarize what we’ve learned so far about building an annotation-powered toolkit for fact checkers. I start with no a priori knowledge of EPA rules governing release of fracking wastewater, and only a passing acquaintance with the cited source, occupy.com. So the first order of business is to marshal some evidence. Hypothesis is ideal for this purpose. It creates links that encapsulate both the URL of a page containing found evidence, and the evidence itself — that is, a quote selected in the page. There’s a dedicated page for each DigiPo investigation. It’s a wiki, so you can manually include Hypothesis links as you create them. But fact-checking is tedious work, and students will benefit from any automation that helps them focus on the analysis. That’s really helpful, but it still requires students to acquire and use the correct tag in order to populate the widget. We can do better than that, and I’ll show how later, but here’s the next thing that happened: the timeline. While working through a different fact-checking exercise, I found myself arranging a subset of the tagged annotations in chronological order. Again that’s a thing you can do manually; again it’s tedious; again we can automate with a bit of tag discipline and some tooling. If you do much online research, you’ll know that it’s often hard to find the publication date of a web page. It might or might not be encoded in the URL. It might or might not appear somewhere in the text of the page. If it does there’s no predictable location or format. You can, however, ask Google to report the date on which it first indexed a page, and that turns out to be a pretty good proxy for the publication date. I wrote the post on Oct 30, Google indexed it on Oct 31, that’s close enough for our purposes. I made another bookmarklet to capture that date and add it, as a Hypothesis annotation, to the target page. Timeline. Annotations on the target page with a googledate tag, in chronological order. Related Annotations. Annotations on the target page with a tag matching the id of the wiki page. With the bookmarklets now wrapped in an extension we returned to the problem of simplifying the use of tags corresponding to wiki investigation pages. Hypothesis tags are freeform. Ideally you’d be able to configure the tag editor to present controlled lists of tags in various contexts, but that isn’t yet a feature of Hypothesis. You activate the tool from a page that has evidence related to a DigiPo investigation. It reads the DigiPo page that lists investigations, captures the wiki ids of those pages. and presents them in a picklist. 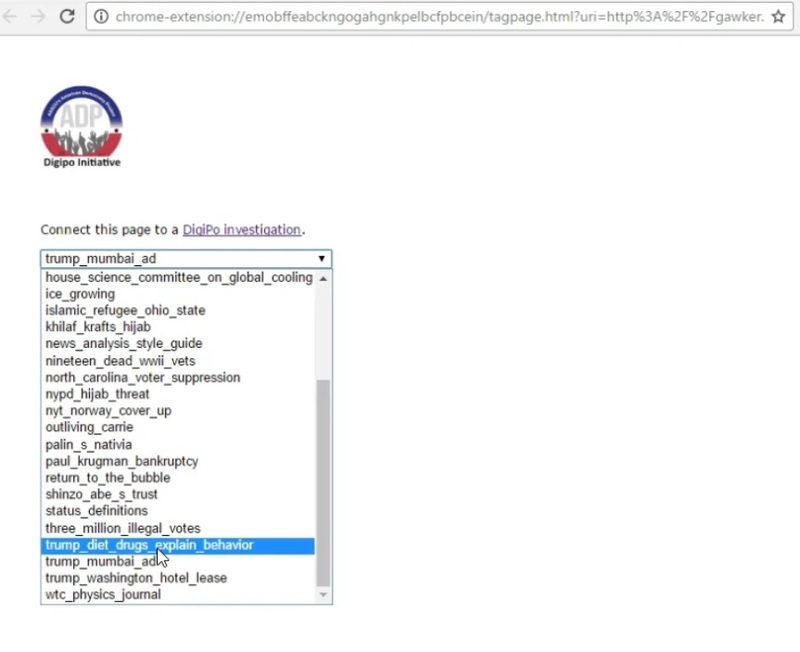 When you choose the investigation to which the current page applies, the current page is annotated with the investigation’s wiki id and will then show up in the Related Annotations bucket on the investigation page. While I was doing all this I committed an ironic faux pas on Facebook and shared this article. Crazy, right? I’m literally in the middle of building tools to help people evaluate stuff like this, and yet I share without checking. Why did I not take the few seconds required to vet the source, bipartisanreport.com? It’s ridiculously simple and powerful. 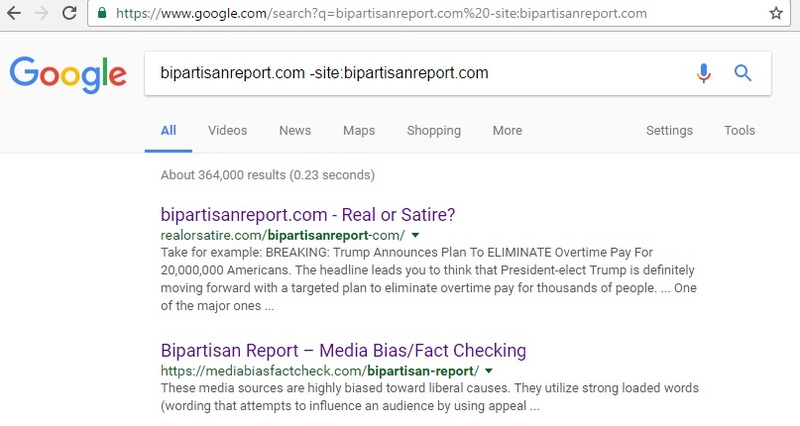 I can see at a glance that bipartisanreport.com shows up on a couple of lists of questionable sites. What does the web think about the sites that host those lists? I can repeat Google this Site to zoom in on them. Another tool in the kit, Save Facebook Share Count, supports the sort of analysis that Mike did in a post entitled Despite Zuckerberg’s Protests, Fake News Does Better on Facebook Than Real News. Here’s Data to Prove It. How, for example, has this questionable claim propagated on Facebook? There’s a breadcrumb trail in the annotation layer. On Dec 26 I used Save Publication Date to assign the tag googledate:2016-08-31, and on the same day I used Save Facebook Share Count to record the number of shares reported by the Facebook API. On Dec 30 I again used Save Facebook Share Count. Now we can see that the article is past its sell-by date on Facebook and never was highly influential. Some of the annotations contain Hypothesis direct links to related annotations. If you open this annotation in the Politico article, for example, you can follow Hypothesis links to related annotations on pages at USA Today and Science. This approach doesn’t feel quite right yet, but I suspect there’s something there. Using these tools you can gather a lot of evidence pretty quickly and easily. It then needs to be summarized effectively so students can reason about the evidence and produce quality analysis. The toolkit embodies a few ways to do that summarization, I’m sure more will emerge. Each annotation links to Mike’s definition. 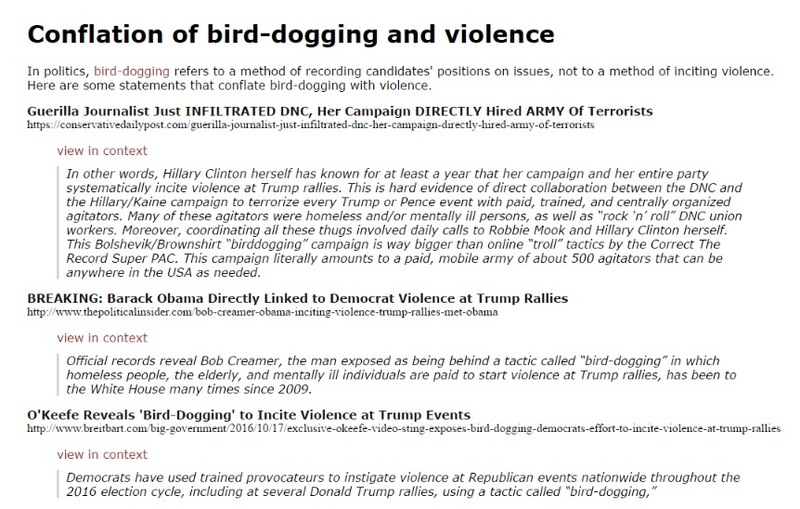 Collectively they form a data set that can be used to trace the provenance of the bird-dogging = violence meme. A digital humanist could write an interesting paper on how the meme flows through a network of sources, and how it morphs along the way. But how will such evidence ever make a difference? It can sometimes seem, in this polarized era, that we can agree on nothing. But we do agree, at least tacitly, on the science behind the technologies that sustain our civilization: energy, agriculture, medicine, construction, communication, transportation. When evidence proves that cigarettes can cause lung cancer, or that buildings in some places need to be earthquake-resistant, most of us accept it. Can we learn to honor evidence about more controversial issues? If that’s possible, annotation’s role will be to help us marshal that evidence. 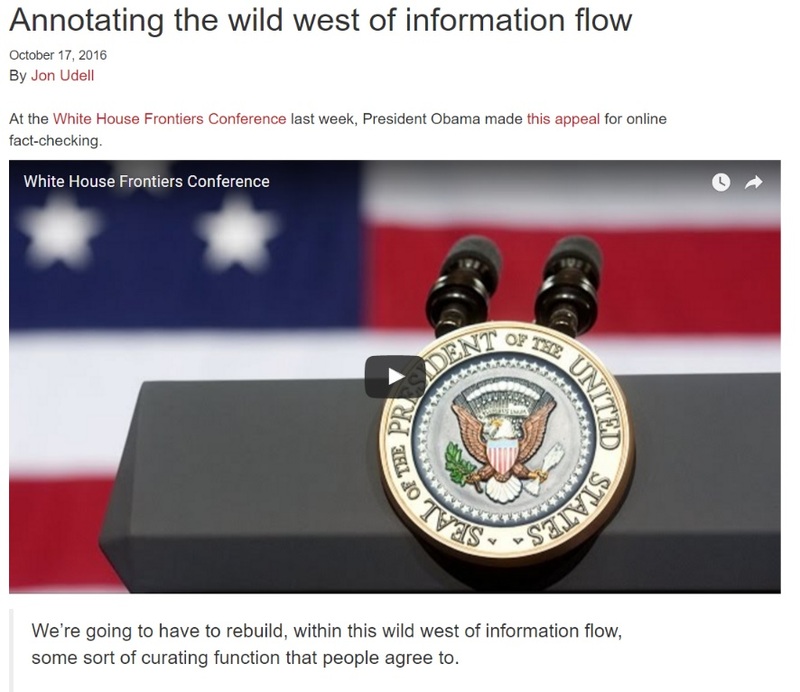 In Annotating the wild west of information flow I responded to President Obama’s appeal for “some sort of curating function that people agree to” with a Hypothes.is thought experiment. What if an annotation tool could make claims about the veracity of statements on the web, and record those claims in a standard machine-readable format such as ClaimReview? The example I gave there: a climate scientist can verify or refute an assertion about climate change in a newspaper article. I was a bird-dogger for some events in 2008 and as a blogger got to know a bunch of bird-doggers in my work as a blogger. Clinton didn’t invent the term and it has nothing to do with violence. So he annotates the statement. But he’s not just refuting a claim, he’s explaining what bird-dogging really means: you follow candidates around and film their responses to questions about your issues. Why the heck am I going to write a comment that is only visible from this one page? There are hundreds (maybe thousands) of pages on the internet making use of the fact that there is no clear explanation of this on the web. Mike’s annotation does two things at once. It refutes a claim about bird-dogging on one specific page. That’s the sweet spot for annotation. His note also provides a reusable definition of bird-dogging that ought to be discoverable in other contexts. Here there’s nothing special about a Hypothes.is note versus a wiki page, a blog post, or any other chunk of URL-addressable content. An authoritative definition of bird-dogging could exist in any of these forms. The challenge, as Mike suggests, is to link that definition to many relevant contexts in a discoverable way. The mechanism I sketched in Annotating the wild west of information flow lays part of the necessary foundation. Mike could write his authoritative definition, post it to his wiki, and then use Hypothes.is to link it, by way of ClaimReview-enhanced annotations, to many misleading statements about bird-dogging around the web. So far, so good. But how will readers discover those annotations? Suppose Mike belongs to a team of political bloggers who aggregate claims they collectively make about statements on the web. Each claim links to a Hypothes.is annotation that locates the statement in its original context and to an authoritative definition that lives at some other URL. Suppose also that Google News regards Mike’s team as a credible source of machine-readable claims for which it will surface the Fact Check label. Now we’re getting somewhere. Annotation alone doesn’t solve Mike’s problem, but it’s a key ingredient of the solution I’m describing. If we ever get that far, of course, we’ll run into an even more difficult problem. In an era of media fragmentation, who will ever subscribe to sources that present Fact Check labels in conflict with beliefs? But given the current state of affairs, I guess that would be a good problem to have.